I shot photos and videos of what I saw there and my goal is to share the highest quality footage possible and go over the differences between known objects (airplanes, satellites, etc.) versus something very very different, something that definitely doesn’t move or operate like any human craft I know of. Just because something is moving and blinking in the sky doesn’t mean it’s an alien. I’d like to report that aliens landed, I got to high five one, they took me aboard their ship, I got a guided tour of the galaxy, and I’ve got hundreds of pictures and hours of footage to show you all. 😀 That’s my dream. What I saw was, well, a little less obvious than that. Because there’s often so much debate over if stuff is real or not, I’m really going to go into detail regarding what I saw, what things may or may not be, and ultimately let you guys decide what you think is manmade versus something else altogether. 🙂 This isn’t going to be a short post, I’ll tell you that right up front, and we’re going to cover a lot of ground so that we all understand what those blinking lights in the sky are and are not. So with that said, let’s begin! Okay, so before I show you what I saw, it will help to go over a little background regarding how things look. People often look at this stuff and say, “Oh, pfff, that’s just an airplane. That’s a satellite. That’s a military aircraft. Thats’s a balloon.” etc. and either dismiss it altogether or come to conclusions that something is alien when it actually isn’t. Because of this, I made a point to shoot a variety of things (including obviously not alien things like airplanes) so that we can all compare and contrast and see the differences. I don’t claim to be an expert in UFO identification by any stretch of the imagination. I’m very familiar with the ins and outs of photography and love space in general, but most of this stuff is brand new to me so I’ve been doing a lot of research as to what’s what after this trip. The ECETI ranch is run by James Gilliland. I don’t know much about him, but he’s a cool guy in person. 🙂 I like him. He pretty much does his own thing and he runs online radio shows where he shares about his experiences and interviews others who are involved with extraterrestrials. People that are working towards the upliftment of human consciousness always get major cool points in my book. Over the 3 days I was there, he did multiple recordings either shooting videos or hosting radio events in his private studio. Evidently he’s lived at this ranch (there’s more buildings other than the one above) for something like 25-30 years so he’s had PLENTY of sightings. The people who live here are used to the sightings such that it’s not a big deal. It’s the norm. They happen on a regular basis, mostly night sightings, as well as some day sightings. From what I heard from others who follow him and his work, he’s been taken aboard alien spacecraft several times, there’s been multiple landings of alien spacecraft at this ranch (wow), and there’s TONS of really incredible stories regarding what people have seen and experienced here. Things like this are much more clear than some of the other less obvious examples, but no matter what you experience and what you believe, I like the fact that the conversation is happening in the first place, people are asking questions and figuring things out, and people are having their own experiences. So that we can all understand how everyday manmade things appear in the sky, let’s start off by looking at what an airplane looks like when flying in the sky. So the FAA mandates that planes have blinking anti-collision lights on them so that others can see them. Depending on where they are on the plane, the lights are red, green, or white. You’ve seen these flying overhead for sure. We all have. Sometimes you’ll see lights on the whole time, sometimes you won’t. Either way, these definitely aren’t extraterrestrial. 😉 You’ll see a video of this to help illustrate things in just a moment. Satellites are a little different. Even though stars and planets look like the twinkle in the night sky when the atmosphere distorts the light, they don’t steadily blink the same way planes do. The same is true for satellites. Satellites typically don’t have lights of their own. Like the moon, they simply reflect sunlight back at the earth. Their solar panels are good reflectors, and every now and then if the angle is just right, they can even cause a flash of light towards the earth. Usually though, they’re consistent white sources of light that moves at a fixed rate of speed. They’ll often fade out as they approach the horizon. They are also best visible just after sunset or before sunrise because they can reflect the light better. In the middle of the night, the earth is between the satellite and the sun and so it’ll prevent reflections of any satellites overhead. Thus you’ll get fewer satellites visible in the middle of the night and more just after sunset (which is usually when we skywatched). Now one of the great things about satellites is that they’re very predictable. We know exactly where they are at all times. There’s even websites that you can go to where you plug in your location and it’ll tell you every known visible bright satellite that’ll be in the sky at that location. It’ll tell you where in the sky and when it starts being visible, where it peaks and finishes, how bright it’ll be, how long you’ll be able to see it, and so forth. One great thing to do when you see something that looks like a satellite is to go to the site, input your information, and see if what you saw is a known object or not. If you do a long exposure of the satellite, you’ll see its light look steady and its flight path straight. Here’s an example from one on the evening of the 19th when it was partly cloudy, partly clear. If we zoom into the image, we can confirm that the path is indeed straight. From what they said there, they only see 2-3 satellites per evening, and so most everything that looked like a satellite there they assumed was extraterrestrial. Now as satellites move through the sky, they can rotate and create what’s known as satellite flares or iridium flares. Like I mentioned earlier, they happen when the satellite gets just the right angle to reflect the sunlight directly at you. These typically last for just a few seconds and are totally predictable. The satellite gets really bright for those few seconds and then may fade out entirely. Typically they don’t change colors when they flash. The following is not my video, but it’s one I found on YouTube when I typed in Iridium Flares. This will give you an idea of what they look like. Now because these are so predictable, you can simply go onto Heavens Above, punch in your location and time, and it’ll tell you exactly where and when in the sky you’ll see iridium flares in your area, as well as how bright they’ll be! 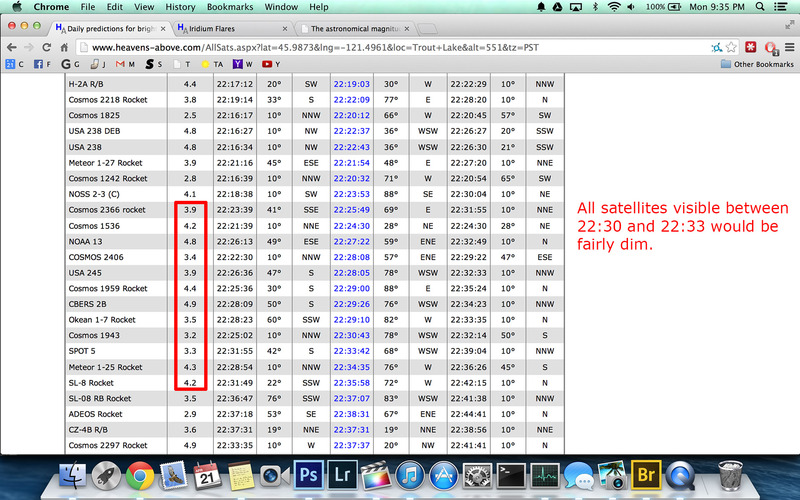 Here’s the Iridium Flares predictions for Trout Lake. When I was at ECETI, we saw a number of things like this, and they were almost all referred to as “powerups,” basically the UFO craft powering up and flashing at us. Sometimes it was used as a way of saying hello. James also mentioned that iridium flares only occur in the western sky, presumably because of where the sun is, but I find that weird considering Heavens Above lists them as happening all over the sky. IMHO, one of the best things to do is to simply go onto a site like Heavens Above (they even have apps that show you these on your phone) so that you can verify whether or not this is a satellite flare or something else entirely. This is something that I just found out exists. This was the very first thing that I saw while I was there, and one of the objects even flashed at us while it was overhead. It was what looked like not one satellite, but two! I didn’t get that particular encounter on camera, but I did see this happen again several other times. Here’s what they looked like if you do a long exposure. 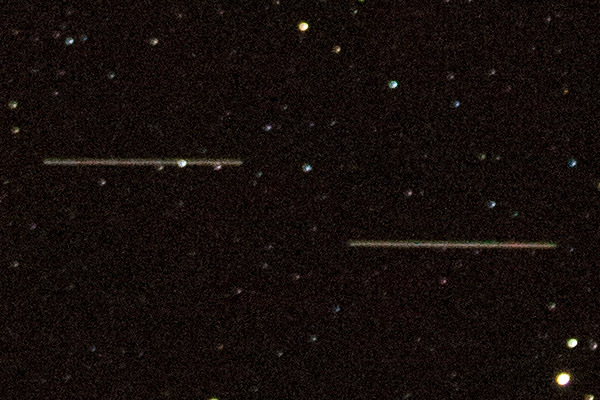 As you can see there’s two satellite-like objects moving together, one sorta behind the other. I didn’t learn this until afterwards, but it looks like these are most likely US Navy satellites. There’s a system called NOSS (which stands for Naval Ocean Surveillance System). They’re pairs of satellites that help the navy locate ships. By measuring the delay it takes for a ship’s signals to reach one satellite then the other, it helps the navy more accurately pinpoint the precise location of those ships. This was a cause for a lot of excitement there. Afterall, most things fly in a straight line! How many things fly in paths like this? Keep in mind that this was only a 4 second exposure, so those things had to have been changing direction faster than once a second. Something that other people who live on the ranch have reported is that they see zig-zagging pattern all the time. In fact they have a name for it. They call it wobbling. Is this an extraterrestrial source? That’s certainly a possibility! I do have another thing to mention before I show you the video of these objects in motion. The camera lens I was using has image stabilization built-in (70-200 2.8 IS II) which compensates for any handshake by physically moving one of the many lenses within the lens housing. See the Stabilizer setting on the side of the lens? It’s there to help compensate for things like handshake. Underneath that is a “Stabilizer Mode” setting. Mode 1 is the normal mode when you’re handholding. It compensates for handshake both up and down and side to side. Mode 2 is designed for panning. It’s there if you want to take a photo while moving the camera sideways. When it’s doing this, it’ll let you move the camera on one axis without resisting you while stabilizing on the other axis. This is the mode I was on when doing the video at first. The idea was that I’d want to pan sideways to track an object and let the camera correct for any shake up and down. Now the IS is smart. It’s aware of when it’s on a tripod and will shut itself off to prevent the image drifting or floating around when it should be steady, but this may not happen if you have just been touching the camera or if it’s really windy. Thus, in that case, it’s very possible that the IS on my lens was actually moving the image for me when it otherwise shoulda been still. Let’s take a super closeup look at the zig zag path once again. You can see the non-straight path very clearly. You’ll also notice that the stars around it are all funky shaped. I don’t think this is due to aberration from my lens (shot wide open). Yes it’s true that astrophotography is one of the most demanding applications of camera gear and really shows off any imperfections within a camera and lens, but in this case, it looks like the lens/camera was moving somewhat which is why the stars look so weird. To give you another comparison, here’s a similar shot taken that evening when things were locked down more securely. (I think IS was off in this case as well.) This shot was of another dual satellite, taken less than an hour later with the identical camera settings (ISO 25600, f/2.8, 4s exposure). Notice how the stars are rounded and more like point sources as they should be. So even though that zig zag image looked like it had potential at first, I’m gonna have to rule it out as something alien. Anyways, here’s the video from the two objects that gave me the zig zagging image. There were multiple objects that started flashing in the sky like that. They’d change colors (something I don’t believe Iridium Flares typically do) and there were several objects all doing their thing at the same time. I couldn’t get all of them and I even missed some when moving the camera 🙁 but I did capture a few of them, and they’re incredibly cool to see. 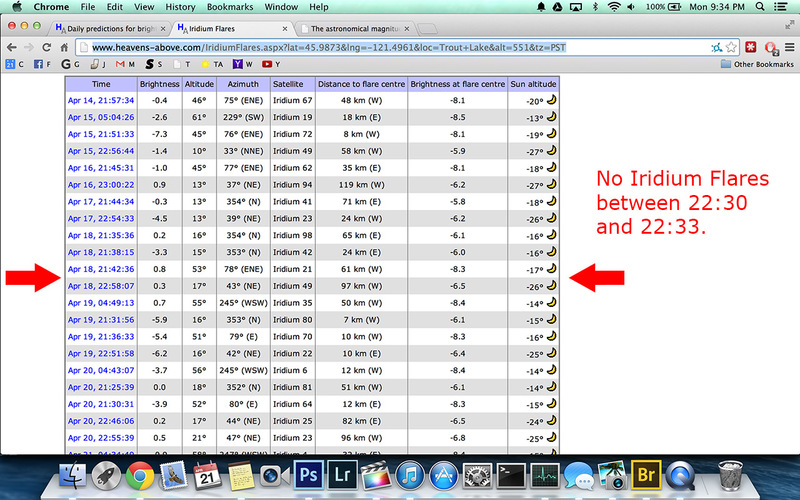 Remember how I mentioned that Iridium Flares can be predicted online? Well this was shot from 10:30pm to 10:33pm. If you look online, you’ll see there’s no iridium flares happening there at that time. So it wasn’t an iridium flare. Besides, I don’t think those change colors or flash repeatedly like these things did. What about any satellites whatsoever, even the ones that aren’t known to flash? If we look online on the 18th, change the minimum brightness to 5.0 (to allow for even the dimmest of objects to show up on the list), there are several satellites visible in the sky at the time of the flashes. If you take a closer look at the brightness of all of the objects listed, they’re all dimmer than magnitude 3.0 meaning they’re all quite dim. These objects in the video were very bright, even without their flashes. That said, the skies there were pretty dark so you could see lots of stars with the naked eye, including many of the dimmer ones. If you’ve watched the videos, you’ll notice that most of the footage is nice and still but that whenever I move the camera, it’s really shaky and awkward. That’s because I’m using equipment that’s geared towards still photography (my background), not video. It’s not designed to smoothly go from one point to another. It’s meant to just move to a location that you want and then securely lock down in that position. The transition isn’t that relevant for still photography because you’re not exposing an image then. Now that I’m getting into video, it’d be nice to get a video head that’s specifically designed to let me pan and tilt the camera smoothly. Here’s what my camera looks like when it’s in shooting UFO mode. A couple things to point out. The camera is a 5D Mark III which has excellent high ISO capabilities (lets me shoot in really dark situations) plus it does a great job shooting HD video. The lens is also really fast (f/2.8) which also helps with low-light shooting. I can zoom out to 70mm to get a wider field of view and then zoom in with the lens once I spot something I wanna focus on. The ballhead is designed for still photography like I said. It’s a RRS BH-40. It does have a tension adjustment so I can tweak how much resistance I get when I unlock the head (great for helping me move the camera as smoothly as possible with such a setup), but it’s still not nearly as good as what I imagine a video head would let me do. The tripod has the center column extended all the way. This makes the whole setup less sturdy and more susceptible to vibrations from wind or my hands, but it lets me point the camera up at the sky and look at the LCD on the back of the camera without having to stoop too low. I shoot the video by looking at the LCD at the back of the camera. Even with the LCD brightness turned down all the way and shooting an almost entirely black subject, it’s still pretty bright at night. This really impacts my nightvision and it takes a second or two for my eyes to adjust when I look away from the LCD and back towards the sky to find the subject to track. Because of this, it’s really helpful when other people look at the sky (either with their naked eye or, even better, using nightvision), and then use their blue lasers to point out objects for me to quickly focus upon. I can see the blue beam faintly on my camera’s LCD so it really does help. In addition to further upgrading my camera gear, a lot of it is learning what’s what in the sky and how to determine what’s real and what’s legit. While I was there, people passed along info for a gentleman named Jon Kelly. He has a background in the TV industry and has been shooting footage at the ranch for years, so he’s been a wonderful person for me to talk to and figure out what’s going on, how to tell the difference between something manmade versus something not, and lots of other video related stuff in general. Thanks Jon!! Once I do get a new head, practicing with it to smoothly pan across the sky is great. Being able to see the stars to get fixed points of reference for the object’s speed and direction is really helpful. The 5DIII is amazing. Shooting clean video at ISO 12,800 allows me to see objects like this without having to resort to using nightvision gear. I’d prefer this because it’s closer to what the human eye sees (no green tint) and thus you can see colors and it simply looks less enhanced. Having a second camera with a wide lens would be great as well. Just let it sit and record and capture whatever’s going on without having to chase after it once you see it (if you see it), and you won’t miss the beginning of the event if it starts off really dark first. Shooting video is great to show color changes and what things really look like. Shooting photos show movement paths so if things make wacky turns, you can see all that illustrated clearly. My camera’s clock was 1 minute and 13 seconds behind the atomic clock so if you check the EXIF of my images, you’ll need to add that amount of time forward to the listed date created. I’ll set that precisely before my next visit. Star Walk is a brilliant app. You point your phone into the sky and it shows you in real time exactly what’s up above you using augmented reality… planet, star, galaxy, etc. I’d like to get something similar for all known satellites. I found some know a few hundred satellites, but I’d like more than that. By the way, if you’d like to go experience this for yourself, it’s available by invitation only. You can check them out online at ECETI.org. The whole story was about confirming whether a UFO on the sky was a satellite or not. Thank you so much for your effort. Good job! I have been to the ECETI ranch a few times before and have been looking for changes in velocity, either in the magnitude or the direction. If a UFO can slow down or speed up or make a turn, that is certainly not a satellite and if there is no regular flash nor sound, that is certainly not an airplane. The only thing left behind is something extraterrestrial. By the way, when you go back again, please focus your attention to the flashing lights on Mt. Adams as well. Get the brightness and size of them, i.e. angles subtended to our eyes. Based on the data, we can estimate the actual size of the light on the slope of the mountain. The distance from the slope to the ranch is 13 miles. If its diameter is tens of feet, that certainly could not be something brought there by the hikers.